The report provides a rough estimate of the potential drag on job growth that will occur if Congress enacts the American Health Care Act (AHCA), which repeals the Affordable Care Act (ACA). Specifically, it estimates where we would be on jobs if the AHCA is enacted and everything else stays the same (the “all-else-equal effect”) relative to the jobs picture under the ACA in coming years, by state and congressional district (CD). Our methodology and rationale were explained in detail in a report (Bivens 2017) released in January that estimated the drag on aggregate demand, and hence on job growth, that would have resulted from a partial repeal of the Affordable Care Act. Our current methodology adjusts for the specific provisions in the AHCA but the overall forces remain the same. In short, by repealing the ACA and enacting the AHCA, Congress would impose a large spending cut as subsidies to purchase health care under the ACA give way to smaller tax credits under the AHCA. The benefit cuts would come mostly out of the pockets of cash-constrained households that will be likely to significantly cut back their spending in response to lower disposable income, while the tax cuts in the ACA repeal would disproportionately go to high-income households who tend to save a significant portion of increases in disposable income. On net, the shortfall in spending (or aggregate demand) would translate into slower job growth. Our full results are provided in Figures A and B. Nationally, all-else-equal, the AHCA could slow job growth by 409,000 in 2019, by 1.1 million in 2020, by 1.6 million in 2021, and by 1.8 million in 2022. 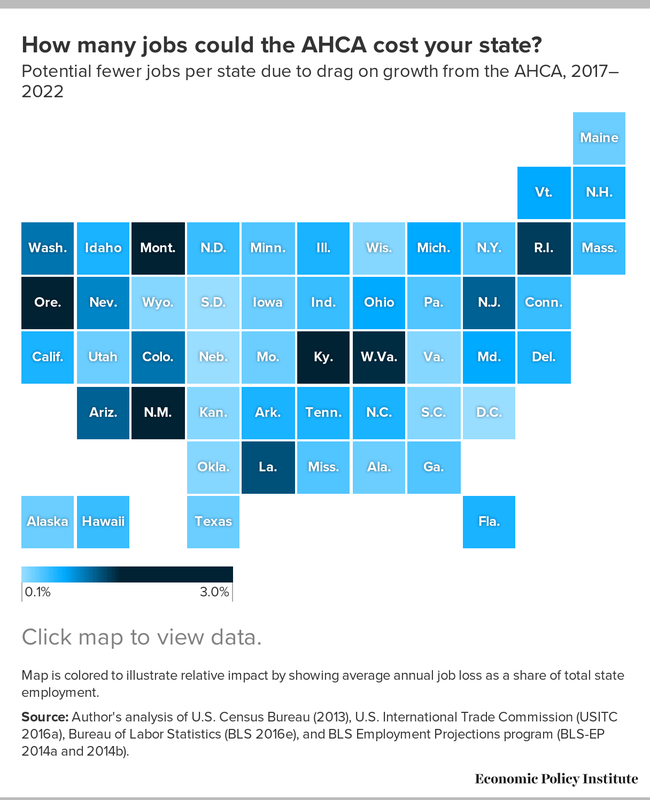 The 15 states with the largest reductions in job growth, ranked by jobs-reduced expressed as a share of the total employed population in 2015 are: New Mexico, Kentucky, Montana, Oregon, West Virginia, Rhode Island, Louisiana, New Jersey, Arizona, Washington, Colorado, Nevada, Vermont, Michigan, and Ohio. Map is colored to illustrate relative impact by showing average annual job loss as a share of total state employment. The analysis is done at the congressional district (CD) level, then the summation of effects in each CD is undertaken to get statewide effects. For notes on the CD analysis, see the table note to Table 1. Source: Author's analysis of U.S. Census Bureau (2013), U.S. International Trade Commission (USITC 2016a), Bureau of Labor Statistics (BLS 2016e), and BLS Employment Projections program (BLS-EP 2014a and 2014b). The nongroup market spending is the net outcome of repealing ACA subsidies and introducing new AHCA tax credits. We take estimates of current health exchange enrollees by the Kaiser Family Foundation (KFF) and apply estimates from Cutler (2017) on the change in enrollment spurred by the AHCA to get a measure of remaining enrollment in nongroup markets by congressional district (CD). We use this measure to allocate the nationwide amount of tax credits estimated by the Congressional Budget Office (CBO). We also provide an age adjustment that estimates higher tax credits going to CDs whose age 18–64 population skews older, reflecting the fact that under the AHCA tax credits are larger for older enrollees. Specifically, we multiply the share of the 18–64 population that is between 30 and 49 by 1.375 and the share that is 50 and over by 1.875, reflecting the greater generosity of tax credits for these populations relative to those received by the under-30 population. For Medicaid spending we allocate the CBO estimates of Medicaid spending reductions across states by using the Blumberg et al. (2016) estimates of how partial ACA repeal would be borne. Within states, we allocate the incidence of these spending cuts across CDs proportionally to each CD’s share of the population with incomes beneath the federal poverty line. For tax cuts, we assume 40 percent of the revenue accrues uniformly across CDs, while allocating 60 percent of it proportionally to each CD’s total share of the population with incomes over $150,000. Output multipliers are 1.4 for the nongroup spending reductions, 2 for Medicaid spending reductions, and 0.4 for the tax cuts. These parameter choices are explained in Bivens (2017). In 2019, we divide the output change by $146,000 to get employment changes, also explained in Bivens (2017). For each year after 2019, we increase this divisor by 1.5 percent, reflecting expected productivity growth over that time. Bivens (2017) provides the necessary macroeconomic context for assessing the overall job-growth implications of ACA repeal. The important points are simply that the AHCA cuts spending on Medicaid and subsidies to help people purchase health insurance (and health care) in the nongroup (individual) market, and cuts taxes that disproportionately fall on higher-income households. This combination of spending cuts borne by low and moderate-income households and tax cuts enjoyed by high-income households makes it a drag on aggregate demand growth. This is simply because low- and moderate-income households spend a higher share of their disposable income. The AHCA’s cuts occur further in the future than those modeled in Bivens (2017). While there is strong evidence that the economy’s growth will be constrained by the low level of aggregate demand (spending by households, businesses, and governments) even through 2019, it is hard to speak with certainty about aggregate demand constraints too far after 2019. 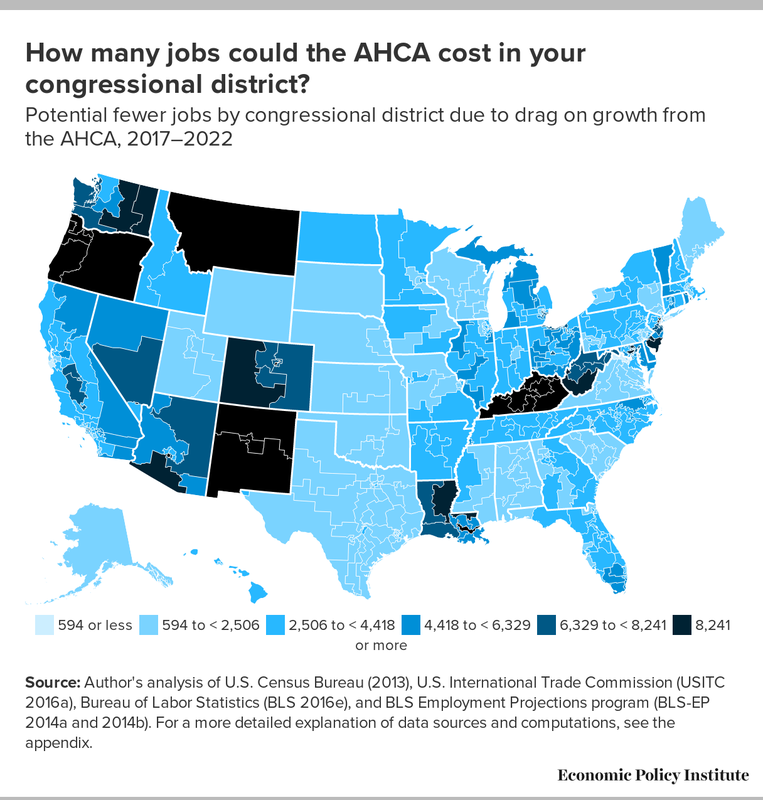 There are reasons to believe that this growth may still be demand-constrained and hence the AHCA will translate directly into the job losses specified. On the other hand, many macroeconomic projections indicate that the economy will not be so constrained, and that nonfiscal tools (mostly interest rate reductions engineered by the Federal Reserve) could neutralize the fiscal drag from ACA repeal and replacement such that no downward drag on jobs occurs. As we emphasized previously, however, since 2008, macroeconomic projections have proven wrong. Since 2008 macroeconomic projections have generally indicated that the economy would break free of aggregate demand constraints in the next three years, but that consistently failed to occur. Given the constant disappointment of these projections, and given rising concerns that “secular stagnation” could lead to a future in which chronic aggregate demand shortfalls become structural features of advanced economies, it seems sensible to worry about demand-constraints even four and five years down the road. (See Summers 2014 for the best summary statement of the potential for secular stagnation and its effects.) The AHCA would impose a considerable fiscal drag on job growth, and policymakers should know just how hard other levers of policy would have to work to overcome it. Given all of this uncertainty, we present our findings as a drag on potential job growth, rather than as clear predictions of “jobs lost.” These estimates are implicitly a measure of how much harder other macroeconomic policy would have to work to neutralize the demand drag stemming from AHCA enactment. Given that policymakers should be deeply uncertain if other tools of macreconomic policy have the ability to neutralize large negative fiscal shocks, these estimates should be unsettling. Bivens (2017), for example, describes research by Angrist et al. (2013) highlighting the extremely weak effect of interest rate cuts enacted by the Federal Reserve in boosting demand growth. This is particularly true in those congressional districts and states that would be particularly hard-hit by the AHCA. While macroeconomic policy may be able to neutralize the nationwide impact of the AHCA fiscal drag, it is highly unlikely to be able to neutralize it in the particularly hard-hit geographic regions, unless it is unusually finely targeted (and again, interest rate reductions enacted by the Federal Reserve are not finely targeted). The broad method for estimating the drag on job growth is the same as our earlier paper (Bivens 2017), and interested readers can seek the details there. In a nutshell, the fiscal impulses stemming from the spending and tax cuts are estimated separately, output multipliers drawn from the research literature are applied to them, and a crosswalk between the additional output and additional employment is applied. The net of cross-cutting effects gives us our measure of drag on potential job growth. For estimating changes in subsidies and tax credits in the nongroup market, we started with Congressional Budget Office (CBO) estimates of the nationwide spending decline that would be spurred by the elimination of exchange subsidies under the ACA. We then applied these nationwide cuts proportionately across CDs. To apportion these cuts, we used data from the Kaiser Family Foundation (KFF) on current ACA exchange enrollment by CD. We then took CBO national estimates for the new tax credits for nongroup insurance purchase provided by the AHCA. We allocated this new spending by CD by combining the KFF CD data with data estimated by Cutler (2017) on nongroup enrollment changes by CD. Combining the KFF data on current enrollment under the ACA and Cutler’s data on the size of coverage losses by CD post-AHCA, we then can back out a measure (adjusted for age bands as we noted) to nongroup enrollment after the AHCA by CD. We then made an adjustment to spending by CD based on the proportion of the age 18-64 population in each CD that fell into three separate age-bands (19-29, 30-49, 50-64). This adjustment reflects the fact that the AHCA tax credits are more generous for older enrollees than younger enrollees. This lets us allocate the stimulative effect of the AHCA tax credits for nongroup purchase. Implicitly, CDs whose 18-64 population skews older will see larger tax credits flowing into their district from the AHCA. The net impact of ACA spending losses and AHCA tax credits on the nongroup market in each CD is used to calculate output and employment impacts. For estimating changes in Medicaid spending, we take the national estimate of the reduction in Medicaid spending by the CBO, and allocate it across states according to estimates made by Blumberg et al. (2016) in their estimate of partial repeal. This is likely not perfect, but, should work well in the early years of the AHCA (which is what we’re examining). In later years, the CBO estimate includes projections about states that have not yet accepted the ACA Medicaid expansion that would do so should current law persist, and Blumberg et al. (2016) make no attempt to estimate these across states. There is a good reasons why we do not use the estimates by Cutler (2017) on falling Medicaid enrollment across CDs to allocate changes in Medicaid spending. His estimates are for 2026, and implicitly include these later years’ decisions about new states that would accept the ACA Medicaid expansion under current law, but will not under the AHCA. Given all of this, we think the Blumberg et al. (2016) estimates, which show very large differences (appropriately so) of the effect of Medicaid cuts on expansions versus non-expansion states, are the most useful for allocating these Medicaid cuts across states in the near term. Once these Medicaid cuts are allocated across states, we allocate them proportionally across CDs within a state by using the CD’s share of population beneath the federal poverty line, as reported in the American Community Survey (ACS). For the share of the AHCA tax cuts accruing across CDs, we assume that 40 percent the nationwide tax cuts are distributed uniformly, while the remaining 60 percent are allocated across CDs proportionally to the district’s share of households making over $150,000 per year, again from the American Community Survey (ACS). This reflects the Tax Policy Center (TPC 2017) estimates of the incidence of tax cuts from ACA repeal. For output multipliers, we applied 1.4 to the net change in subsidies and tax credits for nongroup insurance purchase, 2 to the Medicaid changes, and 0.4 to the tax changes, with the sources of these provided in Bivens (2017). For translating output changes into employment changes, in 2019 we divide the output change by $146,000 (the ratio of output to full-time equivalent employment (FTE) in 2015) and inflated by 6 percent to account for productivity growth between 2015 and 2019. After 2019, we boost this FTE per output measure by 1.5 percent to account for continuing productivity growth. Angrist, Joshua, Òscar Jordà, and Guido M. Kuersteiner. 2013. “Semiparametric Estimates of Monetary Policy Effects: String Theory Revisited,” Working Paper Series 2013-24, Federal Reserve Bank of San Francisco. Bivens, Josh. 2017. Repealing the Affordable Care Act Would Cost Jobs in Every State. Economic Policy Institute. Summers, Lawrence. 2014. “U.S. Economic Prospects: Secular Stagnation, Hysteresis, and the Zero Lower Bound,” Business Economics, vol. 49, no. 2, National Association for Business Economics.